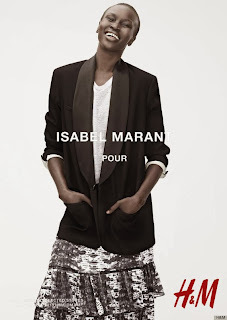 Isabel Marant made an announcement back in June that a lovely collaboration with H&M would hit stores this autumn. Well, ads are now in rotation and fashion media are on the prowl checking out the pieces in person in preparation for the November 14th release date! What good would a high powered fashion collaboration be without validation from the fashion media supremes? The box blazer pictured below is visually captivating with all of its color and seemingly tribal inspiration. The piece definitely caught my attention. What do you think? Will the collection be Notable or Not?